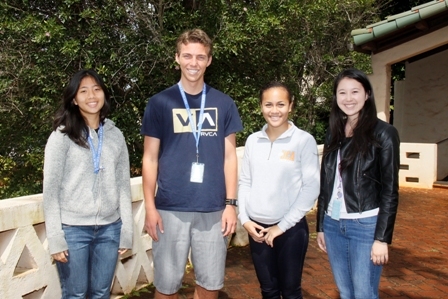 A total of 12 Kamehameha Schools Kapālama students received commendation from the National Merit Scholarship program. Three members of the class of 2014 qualified as National Merit Scholarship Semifinalists, with one student being named a semifinalist for the National Achievement Scholarship program and eight others earning the distinction of National Merit Scholarship Commended Students. Terina Faagau is a semifinalist in the 2014 National Achievement Scholarship program, an academic competition for Black American high school students. She was one of 1,600 semifinalists named on the list from the 160,000-plus juniors that participated in the program. The finalist list is expected to be announced in January, 2014. Seniors Meghan Crowther, Damien Farrant and Andie Hoshijo were all named to the National Merit Scholarsip Semifinalist list. Approximately 1.5 million juniors in more than 22,000 high schools entered the 2014 National Merit Scholarship Program by taking the 2012 Preliminary SAT/National Merit Scholarship Qualifying Test, with approximately 16,000 being named semifinalists. The finalist list will be announced in February, 2014. Eight other seniors from KS Kapālama were listed as Commended Students in the 2014 National Merit Scholarship Program. They were Jonah Cabudol-Chalker, Kealyssa Castillo-Martin, Anuhea Delude, Chase Hensarling, Gabrielle Lee, Nathan Lee, Kamahao Shimaoka and Alexander Simafranca. From left, Andie Hoshijo, Damien Farrant, Terina Faagau and Meghan Crowther, named semifinalists in the National Merit Scholarship program.